Are we ready for a new short-term uptrend? I'd say we are getting close, and on watch for the signs. I'm not sure how strong a new uptrend will be though. My guess is that the market continues to struggle until after the midterm elections. An interesting pattern is showing in this chart of the PMO Index. The rally in late September failed, but then the index resisted the move to the bottom of the range. I'm not sure what to make of it. A sure sign that the selling is finished for awhile is indicated by a dramatic drop in the number of new 52-week lows (thank you Mike Burk).Obviously we aren't there yet, but I will be looking for it every morning next week. In my experience, the number of new lows will drop below 50 for both exchanges. Here are a couple of five-year monthly charts of major indexes with a parabolic sar indicator. 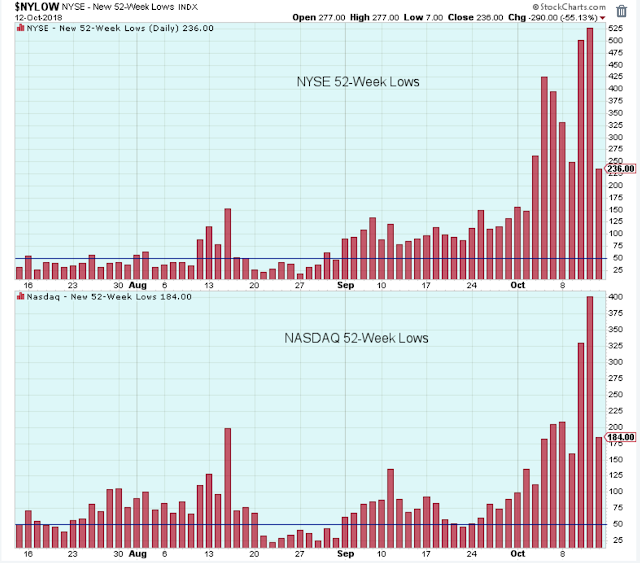 Both charts are on longer-term downtrend signals. I like these charts. It keeps the analysis simple. The market is under pressure, longer-term, until these indicators say otherwise. 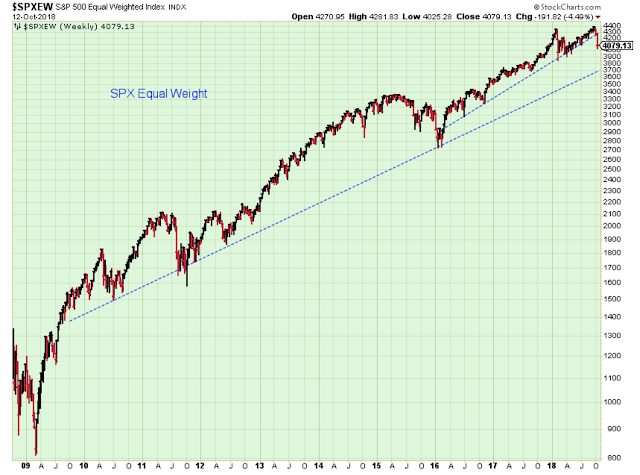 The trend line is clearly broken, so the next technical level to watch is the January lows. 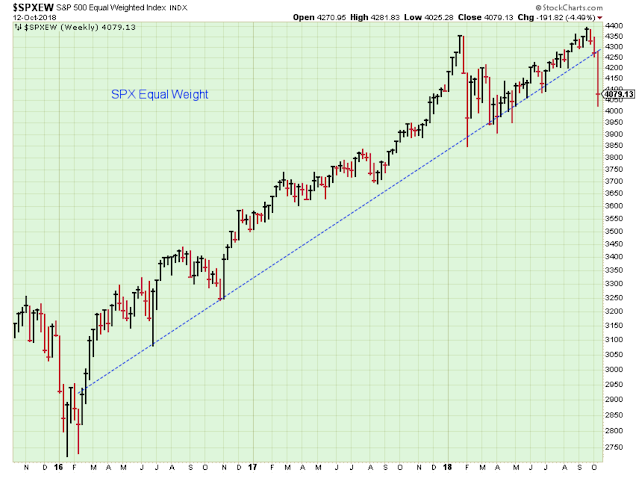 This chart says that the uptrend from the lows of early 2016 through the highs of late 2018 is over, and this means that we are in a downtrend until the market proves otherwise. I'm guessing that the January support will hold at least until the new year unless longer-term rates really start to move higher. Here is a longer-term trendline. 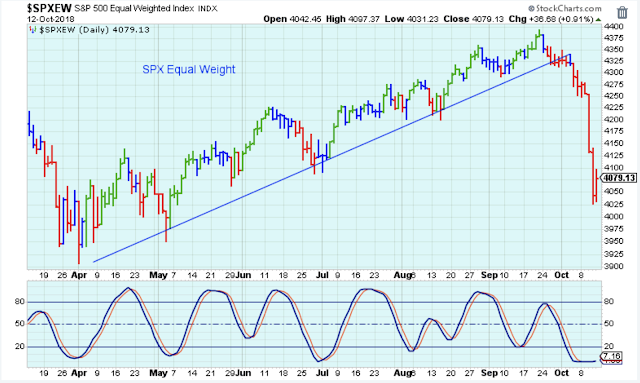 I tend to think that the SPX equal-weight is more likely to touch this trendline before making a new high. Wasn't it Dow Theory that established the notion of bull and bear markets? They need to confirm to the downside in order to declare a bear market. There is a lot of interpretation regarding the levels that establish downside confirmation, so I suggest using these moving averages. I am going to settle for the idea that they both need a weekly close below their 80-week averages in order to confirm a bear market.